Municipal bond funds are among the top performer mutual fund for year 2011. 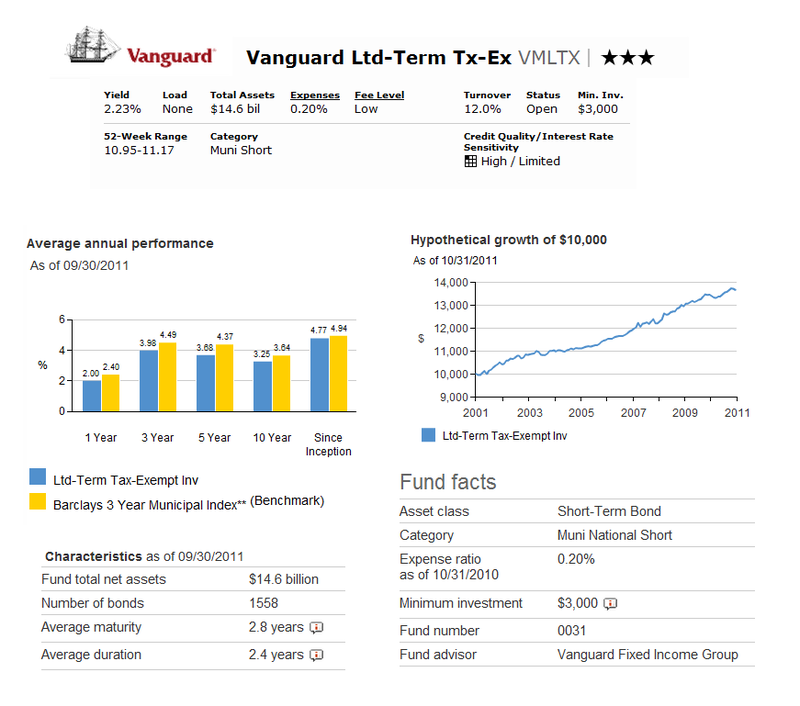 One of the largest muni bond funds is Vanguard Ltd-Term Tx-Ex. This Vanguard fund invests primarily in investment grade municipal bonds. Details about the fund review can be found below. 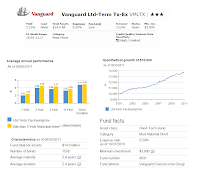 This Vanguard Limited Term Tax Exempt fund is seeking current income exempt from federal income tax, with limited price volatility. This Vanguard fund invests >75% of assets in municipal bonds in the top three credit-rating categories. It may invest minority of assets (<20%) in bonds rated Baa or BBB. The fund invests <5% of assets in securities with lower credit ratings or unrated. This fund is currently managed by Marlin G. Brown. He has been this Vanguard fund manager since February 2008. The fund’s inception date was August 31, 1987. This fund has total net assets of $14.58 billion. The dividend yield is 2.23% and is distributed on monthly basis. The most recent dividend distribution is on October 31, 2011 ($0.0199). The annual expense ratio is 0.20%. This is lower compared to the average in the Muni Short category is 0.78%. Morningstar has rated this fund with 3-star rating. This fund has shown excellent performance for the past 23 years with continuously outperformance. The highest return was in 2000 (6.35%) and the lowest return was in 2005 (1.11%). The YTD return is 2.88%. Based on the load adjusted return, this fund has returned 2.00% over the past year, 3.68% over the past five year and 3.25% over the past ten years. The yield to maturity is 1.1% and the average coupon is 4.0%. Although it is actively managed, this VMLTX fund is a no load fund. Therefore there is no front-end sales load fee for investing in this fund and there is no 12b1 fee as well. Investor needs to provide a minimum of $3,000 for the initial investment to open a brokerage or IRA account of this fund. The subsequent investment is $100. VMLTX fund can be purchased from 69 brokerages, like T Rowe Price, JP Morgan, Td Ameritrade Inc, Vanguard NTF, E Trade No Load Fee, Royal Alliance, Firstrade, Fidelity Retail Funds Network, Schwab Retail, etc. This Vanguard fund has total of 1558 bonds as of September 2011. The average maturity is 2.8 years and the average duration is 2.4 years. The benchmark of this fund is Barclays 3 Year Municipal Index. The top asset allocation of this fund is Bond (91.61%) and Cash (8.39%). The other class of this fund is Vanguard Limited-Term Tax-Exempt Fund Admiral Shares (VMLUX). The primary risks of investing in this bond fund are Income risk, Interest rate risk, Call risk, Credit risk, Liquidity risk, Manager risk, etc. Details can be found in the fund’s website and prospectus.